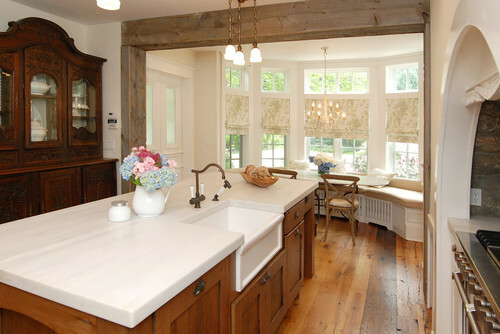 Reclaimed exposed wooden beams, rustic stone, and antique lighting all combine beautifully with fresh white cabinetry in this welcoming Long Island, New York kitchen. The owners are a busy and professional family — the husband is a television executive and the wife is a screenwriter. The family entertains often, so the couple hired Carmela Posillico of AMi Designs to create a space elegant enough for cocktail parties but informal enough for their teen's get-togethers. "This is a great old waterfront home, so I wanted the light cabinetry to reflect the casual seaside environment," says Posillico. "They love antiques, so there's an eclectic mix of furnishings and textures, which give the space an inviting, warm and interesting look." 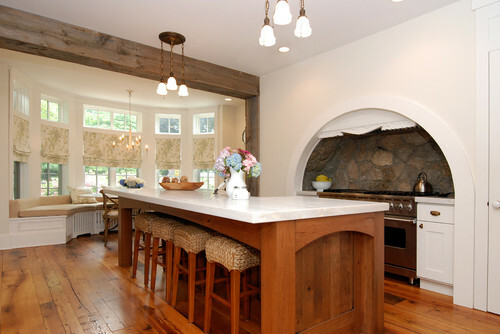 Although it looks like an original part of the kitchen, the rustic reclaimed wood beam actually covers an existing beam, and posts were made to support it. This piece was carefully designed to look authentic, add a great textural element and define the cooking area of the kitchen. Posillico created a breakfast nook at the end of the space for the family to have casual meals in, or to incorporate guests in the space when they're entertaining. Although its palette is relatively simple, the contrast of materials maintains a level of visual interest in the space. Antique lighting, reclaimed wood and rustic stone provide an elegant contrast with the crisp white cabinetry and Greek marble. 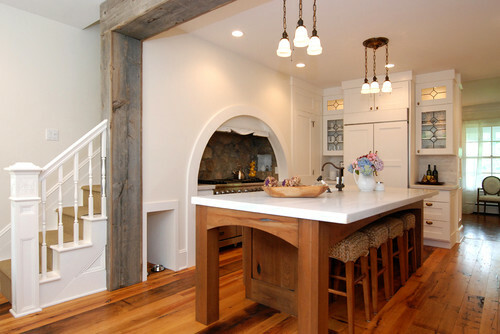 One of the walls in the kitchen shares space with the staircase; Posillico took advantage of the area under the actual stairs to maximize the amount of room in the kitchen. 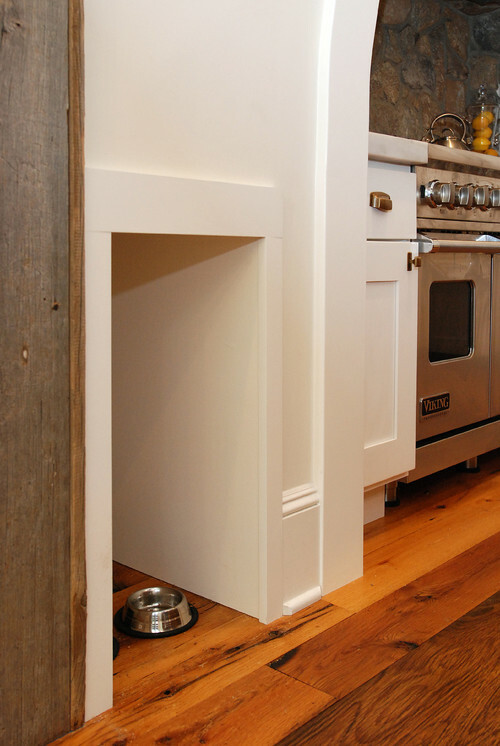 This clever pet-food nook is another space saver. 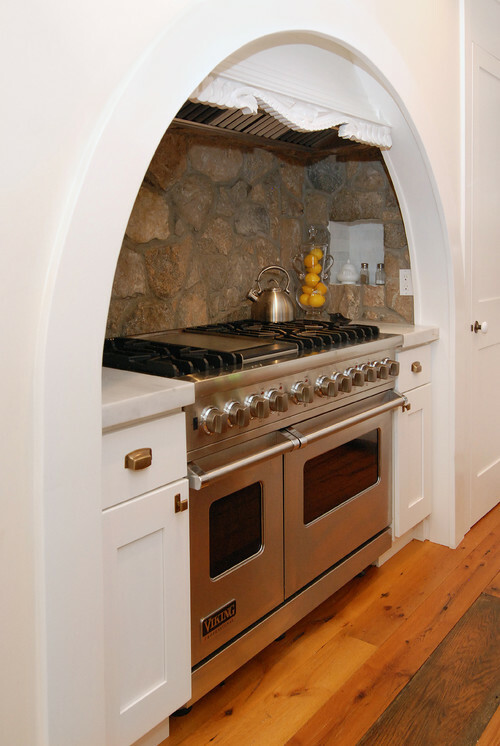 "We really tried to utilize every part of the under stair area, starting from the pantry to the arched range," says Posillico. "And the cats needed their own little space too. They love the little nook, and no one is tripping over their food anymore." The clients found the mahogany cabinet while antiquing, and after they had started construction on the kitchen. Posillico created a custom alcove the piece could fit in without looking too confined. The deep farmhouse sink lends to the rustic feel of the kitchen, and is practical enough to deal with the needs of a large dinner party.